Sadly no free London Underground travel today, but make the most of sharing the same name as William or Kate (or a number of different versions of them) on Chiltern Railways and Mersey Rail. Both networks are offering free travel on Royal Wedding Day, if you can show photographic ID with your name. If you're travelling into London on the Tube today, just expect it to be pretty crowded, particularly in the obvious places like TfL's poster says. It's a Saturday service, but all stations including Westminster are open, although some of them may be temporarily closed if overcrowded. More details on TfL's site. Peter Hendy, London's Transport Commissioner said "All Tube lines will be running and our bus and streets teams will be working flat-out to make sure that the closures and diversions needed are managed smoothly. The whole of TfL is focussed on helping to ensure that a great day is had by all." 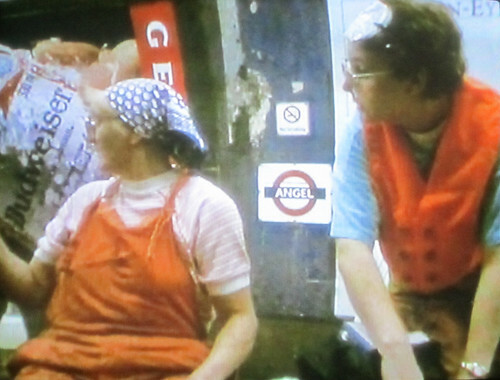 I was kindly sent a review copy of Molly Dineen's eye-opening documentary about 48 hours in the life of Angel London Underground station - Heart of the Angel. She filmed station staff, engineers, travellers and overnight cleaners - or fluffers as they were called - in 1989 before the station had a major rebuild with spacious new platforms and installation of the longest escalators on the Tube. What struck me was how historical the film looked, even though it was only shot just over twenty years ago. The Tube at that stage seemed like another world, punks larking around on platforms, pre Oyster card, extremely manual, dusty, constantly breaking down, frustrated (mainly bespectacled & big haired) commuters sweating as they walked up and down huge flights of stairs - actually - it's not that different from today in many cases. 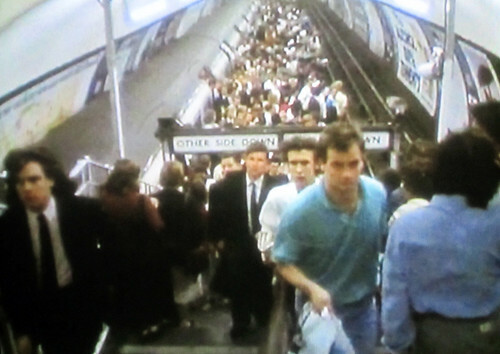 When the film first came out, the Evening Standard claimed that "long suffering commuters demanded that the film be made required viewing for every member of the board of London Underground." It certainly makes an interesting counterpoint to TfL's current glossy videos of engineering work upgrades. The station staff were funny yet totally frustrated at the same time. Dineen's gentle questioning made the staff into the real stars of the film, seeming to speak their thoughts aloud. Mr Simms who manned the lift (on the few occasions it worked) acted like he owned the lift and questioned the passengers who entered it, with philosophical questions like: "Is the world round or flat"? Derek, the station assistant had been working for 45 years and was aware he wouldn't achieve anything more in his life. He spent his time counting out piles change and giving directions to tourists "If you get lost come back and I'll tell you again for nothing." When making a cup of tea in the dilapidated staff room he said: "I'm never miserable, I've just got that sort of face. When I'm asleep I'm happy". What would you have liked to achieve Dineen asks, "I'd like to have been taller", Derek replied. The station manager was aware of how badly the station needed refurbishment but his mind was also elsewhere as he showed Dineen his paintings and sketches of where he's rather be "Lonely places, hilly places". He actually got excited when he was shown drawings of the new station. "It'll be in poshest station in London. Course they won't have little turds like us in charge of it". 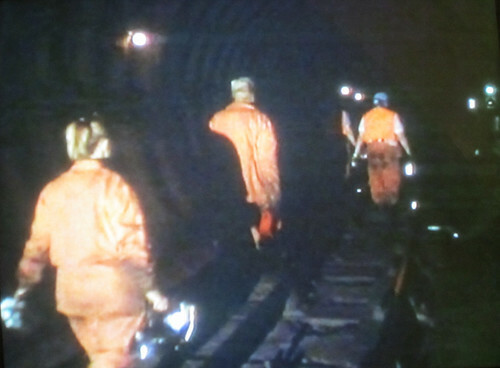 I was fascinated watching the underground crews of mainly female workers who changed on the station platform and then spent the evening picking out human hair & rubbish from the tracks by hand. Much of this is done by machines now (although some cleaning is now men with brushes), but though the fluffers knew their work was backbreaking & almost soul destroying, they went about it with a sense of camaraderie (helped by the fact that many of them were related). At times they came out with poetic thoughts "My days are nights and my nights are days", when they weren't singing or occasionally worried about the sense of something else being underground with them! There were two lovely pieces in the 10 minutes of extra footage which was never shown on 40 Minutes (where it was originally aired). Firstly, a very fluent Customer Service Assistant explaining how both staff & passengers got frustrated with the system and how this boiled over into other aspects of their life outside the Tube. "It's a currency of aggrevation, that gathers value with incredible ease". Finally, under the spotlight was a sweaty engineering worker who'd been moving new tracks overnight. "This is not today is it. This is Victorian. I thought it would be a bit more modern than a pick and a shovel. You're not telling me this is the 21st century and we're doing it like this. You can't tell me in 100 years time there's blokes like us doing this. There's got to be a better way to do this and they're not even looking. What happens when the government finally says run it financially on your own. What are they going to do then?" Heart of the Angel is one of four films in Volume One of the Molly Dineen Collection and available from BFI Filmstore. 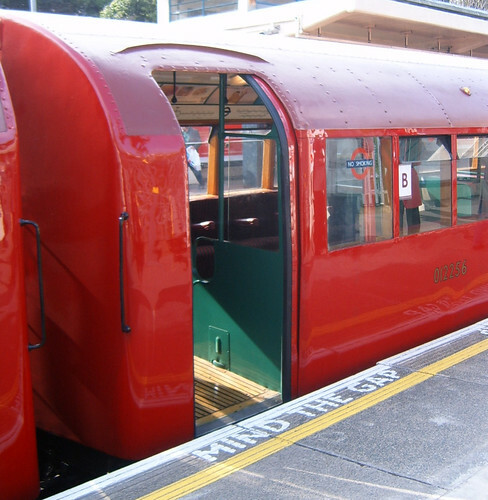 London Transport Museum’s 1938 Tube Stock is back on the tracks. 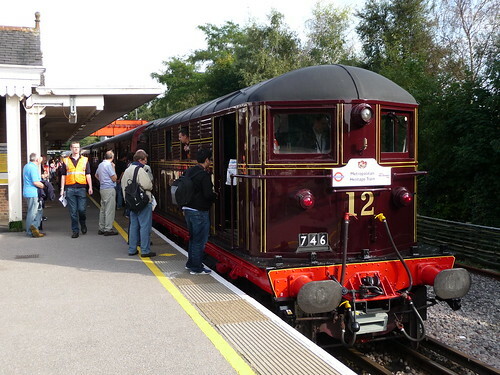 Unfortunately, last September's journey was cancelled but on Sunday 22nd May 2011 London Transport Museum are running four special heritage train journeys. I was lucky enough to travel on the art deco 1938 Tube train a few years ago and it's a real nostalgic treat. All journeys travel via Watford and the North Curve which is a part of the line rarely used for daily services. All tickets include free travel on Sarah Siddons - the oldest working main line electric locomotive in Britain - subject to availability. You can can travel separately on this train as it makes special trips between Harrow-on-the-Hill, Watford Rickmansworth to Amersham. "Engine no. 12 , Sarah Siddons, was built in 1922 and is the last operational Metropolitan Railway electric locomotive; the only surviving working engine out of 20 built by Metropolitan Vickers and named after real or fictitious people associated with the area served by the Metropolitan Railway. The engines had a top speed of 65 miles per hour." said London Transport Museum. Tickets for the Sarah Siddons only are £5.00 for adults and three quid for children. A free heritage bus service, including the Museum's iconic Routemaster RM1 will be making journeys from Rickmansworth Station to the Rickmansworth Festival site at Batchworth Lock. Tickets must be booked in advance on 020 7565 7298. Full details and the timetable are on London Transport Museum's site. "A hat with programmable scrolling message LED display - it would be like a carriage wide text you could send - love them or hate them you could let them know ... hmm thinking about it ... it might need to be a hard hat lol"
The other lucky winners were Thom & Onescoop, who also win a commuting survival kit. If you could contact me with your address details & I'll arrange to get the kits delivered to you. Finally, if you're easing your way back into the commute after the Easter Bank Holiday, Powwownow, the guys behind the Love/Hate Travel campaign, have put together a video with some handy tips on how energise or de-stress your London Underground or bus commute. If only the London Olympics had a competitive commuting category - this would be perfect for it! Thanks again to Love/Hate Travel for the prizes and you can keep up to date with their observations on what people hate & love about their journey on Twitter or Facebook. I've blogged about Chromaroma while it was still in beta, but now everyone with an Oyster card (well anyone with a Pre Pay Oyster) can play. Basically, Chromaroma is a "type of location-based top-trumps. You collect places, identities, modes of transport and passengers as you travel around the city; discover and investigate mysteries attached to different locations and build alliances with fellow passengers that share your journeys." BBC Click have made a short film with good explanation on the security issues involved. And whether we actually want an already crowded London Underground system more clogged up with people rushing around for a game on it. As the Royal Wedding Oyster Cards go on sale today, I wondered if there was any other rail or transport related William & Kate memorabilia around. Thanks to Tim Hall aka Kalyr, I discovered there was. 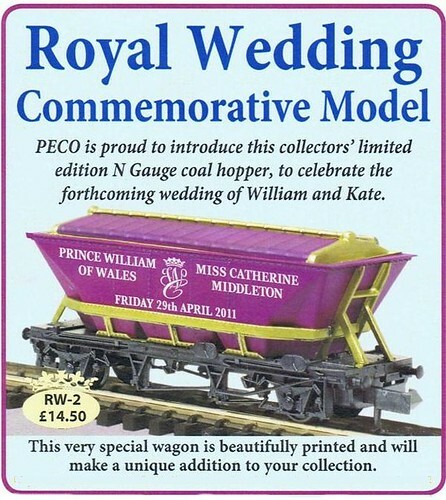 Hold onto your hats, it's the RW-2 Peco Royal Wedding Commemorative Coal Hopper Wagon. A bargain at just £14.50, you can be the proud owner of this special model wagon. The limited edition N Gauge Coal hopper makes the perfect "unique addition to your collection". The "beautifully painted" gold and purple wagon is sure to delight model railway enthusiasts around the world. Great find Tim. 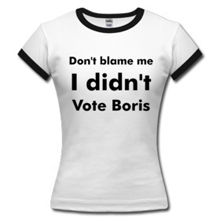 I'll send it along to Royal Wedding Tat who are making their own collection so we don't forget what's out there. 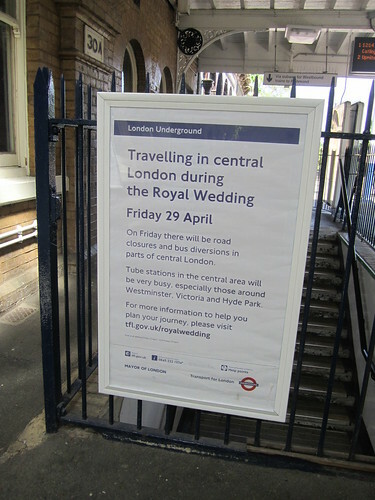 If you see any other transport related Royal Wedding items, please send them my way. 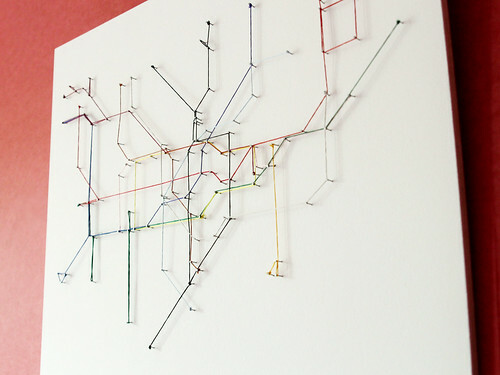 If you fancy doing something crafty over the coming break, you could try making a London Underground Map out of string. The effect is really lovely. String map 2 by fsm vpggruIt's made even better when you see a beautifully shot time lapse video of how it was put together. There's more photos of the map on fsm vpggru's Flickr stream. Hat tip to Sizemore for letting me know. 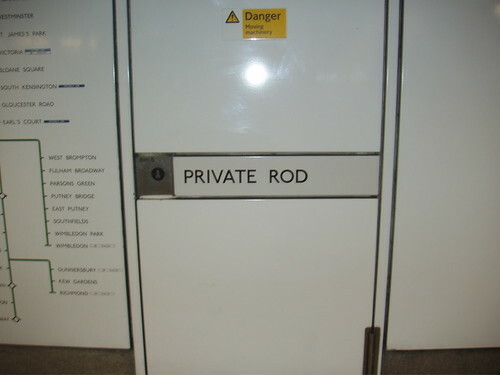 Any more thoughts on Private Rod? Embankment London Underground station has a much photographed door, home to a mysterious "Private Rod"
The door even has its own Facebook page, with people wondering whether "Private Rod" reports to Captain Cabinets. It appears that current London Underground staff don't know why the door's there either. Jon who works for TfL said "I’ve asked around a lot of the usual fountains of knowledge within LU and as yet have not found an answer. 1. The staff at Embankment Tube have no idea what the sign means, but did say that behind the door is nothing but a brick wall! 2. There is a similar door at Ealing Broadway, but again the staff there don't know what it is for." I had heard that it may stand for Rail Operating Department - but they clearly don't do much operating if there's only a brick wall behind the door. Why are there only two of them on the whole network? Unless you've seen them elsewhere! Any more theories as to who or what Private Rod is? 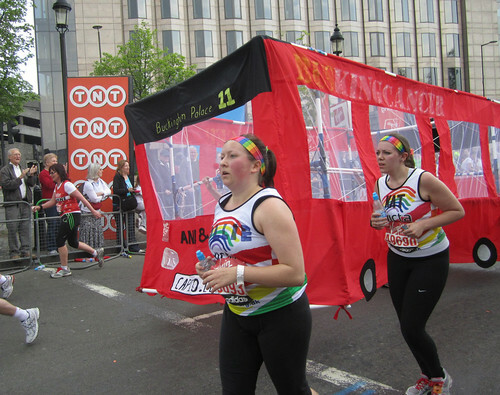 Yesterday's London Marathon was as usual full of loads of runners in fancy dress, amongst them two guys running as a London bus. I'd been waiting at my cheering point for so long, I half expected three to turn up at once, but it never happened. Congratulations to everyone who took part - particularly those running for charity. If you've got a few quid to spare why not sponsor The Guardian's London blogger Dave Hill who ran his first marathon yesterday. Here's my Flickr set of the many other London Marathon runners in fancy dress including one of the many Wills & Kates, Spidermen, Supermen and rhinos. 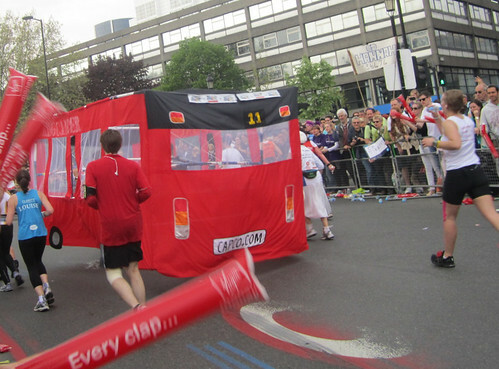 Wonder if next year people will dress up as a London Underground train? Boris visited the District Line between Bromley by Bow and Bow Road stations to see what happens when part of the line is closed. TfL have uploaded a video of his visit where he talks about the works and what they mean for the London Underground upgrade plan. He finds out at first hand what Ballasted Track Renewal is. According to Boris it's "absolutely crucial for the improvement of services on the District Line and all sub-service lines". The video is another example of TfL efforts of trying to show engineering work in action (Tube chief Peter Hendy stressed this was something he wanted to do when I met him with other London bloggers last year). In the video Boris says of the track replacement: "Once it's done this track won't need renewing for another forty years". Not sure how much I'll be using the Tube when I'm a pensioner, but let's hope it's true and will save future commuters the frequent line weekend closures we've been facing. 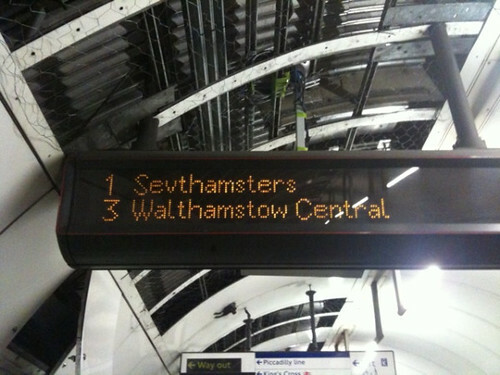 Every so often the platform indicators & in carriage displays have a funny turn. 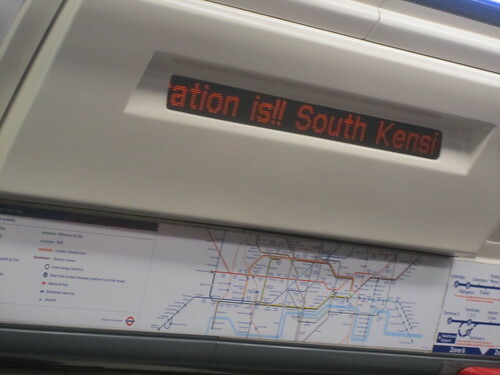 Sometimes this results in the trains being bound for strange locations as Laura from @AboutLondon spotted yesterday. If you spot any other borked displays on your journey let me know. 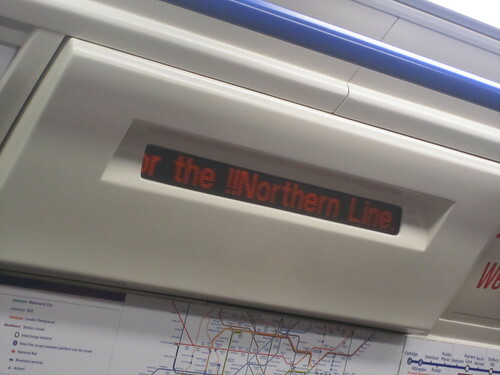 As yet I still don't think much can beat the Northern Line offering a God Service. Regular readers will know I'm always keen to see what people are reading on the London Underground, as it's usually a good indicator of trends in popular fiction, non fiction and now reading devices. Last week the trio opposite me looked very much like an advertisement for how people read on the Tube. On the far right, we have the older man reading the Daily Telegraph. Although you can't see it from the photo, he was wearing a three piece suit, just to complete the picture of the old & traditional City commuter. In the middle was a woman reading Shortlist, representing the rise of the "free sheet". Well perhaps the rise and fall of the free sheet. In 2009 both London Lite and the London Paper evening free sheets closed, but the Evening Standard turned from a paid for paper into a free sheet. But the fall of the evening freebies, Shortlist and Stylist have stepped in to provide a good weekly read with production values, editorial and photography to rival some quality paid for glossy monthlies. I'm sure there's still a place for the "urban traveller" magazines like TNT, but I bet they've eaten into their market somewhat. I remember when magazines like Ms London & Midweek (remember them? 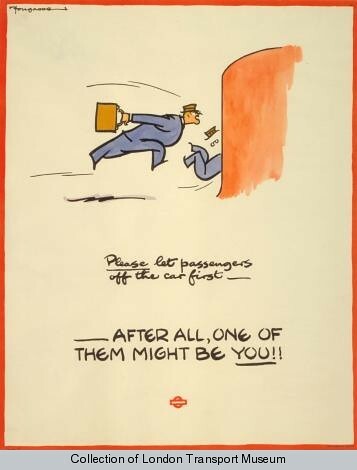 ), were the only freebies outside Tube stations and they were generally full of recruitment ads for secretarial roles. On the left is a lady with an e-Reader - probably a Kindle. As blogged in the past, I'm seeing a huge number of people reading Kindles on the Tube now. There's almost one person in every carriage now (or more from my friend @Izabel_blue's tweet). It'll be interesting to see how this picture will change in five years time. How long will it be before we see more people reading from iPads, Kindles or other e-readers than people reading printed books and papers on the Tube? Following on from the post on Denton Tube station in Gravesend, James Cridland spotted part of a Tube station on Bournemouth! He said "An completely incongruous bit of underground station in the Bournemouth Oceanarium. I have little idea what it's doing here, other than perhaps to convey that we are "underground" - except why would there be an Underground roundel like this? 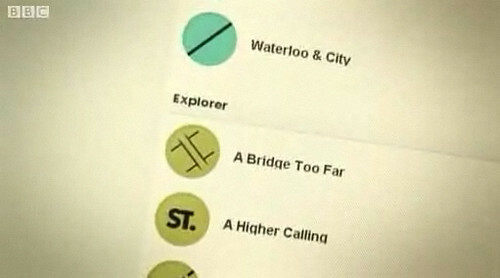 Also of note: the Underground roundel and the sign both use Arial and not Johnston. Not that I'm a font geek or anything." 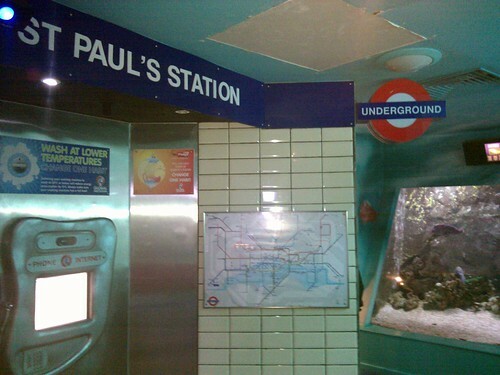 If anyone has any theories on why a bit of the London Underground has been transported to the Oceanarium, please let us know. Also if you have photographs of any other parts of Tube stations which aren't in London, please send them my way. It makes an interesting addition to the Roundels not on the Tube set. Yes, yes, I know what date it was filmed on, but I love this video from BeardedKitten which shows the surprise / obedience when "officials" try to enforce the "Dogs Must Be Carried" signs seen at the bottom of escalators. The powers of the clip board and an authorative voice on the London Underground appear to work wonders. Several people "hired" a dog for a few pence so they could travel on the escalators at Bethnal Green Tube. Speaking of transport related April Fools you might have missed LoveHateTravel's 2015 Tube Map. I love the loop on the District Line leading out to Bushy Park & getting a Tube to Brighton from Brixton, would be fab. 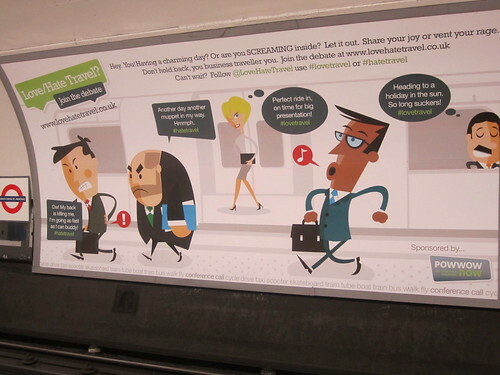 You've probably seen ads around the London Underground from Love/Hate Travel which are getting commuters to share reasons on Twitter or Facebook why they Love or Hate travel that day. I was very kindly sent a "Commuter Survival Kit" which was packed with useful things for my journey. It included an air freshner, hand wipes, umbrella, comfy roll up slippers, mints, a stress ball, shoe shine and an Oyster card holder. The lovely guys and gals there had a few kits spare and offered to give away three kits to readers of this blog. 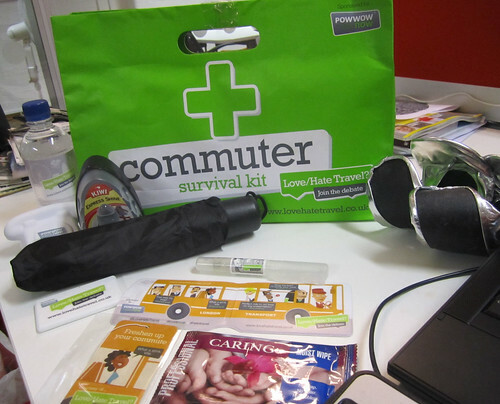 All you need to do to enter, is tell us "what you'd like to see in a Commuter Survival Kit". It could be something practical (perhaps something you already carry in your bag or pocket), something fun to get you through being stuck in a tunnel, something to essential for the summer to deal with the heat, or something for your winter journey. Whatever you like. Love/Hate Travel will choose their favourite and we'll also select two winners at random. Please make sure you leave a name in the comments so we know who you are. Anyone who shows up as Guest or Anon won't count. Please enter once only, so if you've got a lot of ideas, it's best to keep them to one comment! This competition is open to UK readers only. You have until 11.59pm UK time Sunday 17th April 2011 to enter and we'll announce the winners shortly after that, so don't forget to come back to see if you've won! Have fun & good luck. If you follow my tweets, you may have heard I was on Radio 2 last Friday as part of Friday Night is Music Night. No, I haven't got any musical skills whatsoever, but was in the interval break feature on the Tube, following the BBC Concert orchestra's London Transport Suite. These are three movements "a percussiontastic explotion" describe modes of transport no longer with us, the hansom cab, the omnibus and steam trains - the 5.52 from Victorloo! You'll hear me quoting some random facts about the Tube and also in a section at the end. The main thrust of the piece is the Tube in music, films & literature, so you'll also hear an interview with John Hudson who wrote Orpheus in the Underground (better known as the Can Can scene in Peter's Friends) and with mystery author Christopher Fowler, who I was also lucky enough to interview last year about his fascination with the London Underground. If you're in the UK you can listen to the Tube feature on iPlayer until this Friday 8th April. Many thanks to Neil Rosser for the interview - never thought I'd ever hear myself in a classical music piece. A reminder that from today, Saturday 2nd April, until late November, no Northern Line London Underground trains will be stopping at TCR station. MD Mike Brown explains the reasons in the video below, gives a sneak peek at the construction process behind building the new ticket hall and reassures us that the famous Eduardo Paolozzi mosaics will still be preserved (even though some would probably rather the see the back of them!). TfL said "Tottenham Court Road station is over 100 years old and was not designed to be used by the 147,000 people that currently pass through it every day. With the growth in passengers using the Tube and the arrival of Crossrail, that number is expected to grow to over 200,000." and finally connecting with a new Crossrail ticket hall at Dean Street. If you're around Tottenham Court Road and want to use the Northern line you should use nearby Goodge Street or Leicester Square instead. More details are on TfL's site. There are still a number of people who don't understand Tube door etiquette. 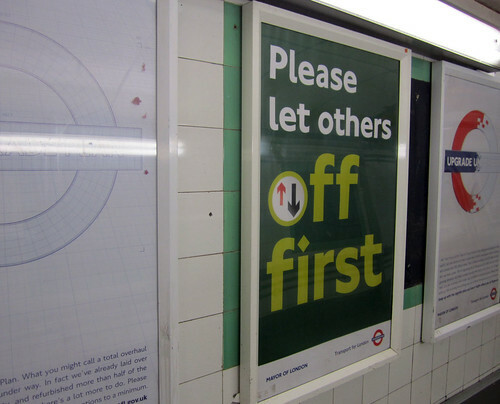 For years London Underground have been trying to tell people that it's a good idea to let people get off the train first before getting on. Many posters have been designed trying to get this (what I'd have thought) simple message across. It might be interesting to see how they've "developed" (or not). I love the sympathetic approach here. Put yourself in the shoes of people trying to get off. How would you like it, if someone barged on before you. 1979, let's have a brief interlude with a trip across to Japan to see how they dealt with this. Would a religious plea help? Let nuns off first. Don't mess with the hand of God! (more vintage Japanese subway manners posters here). Back to London. You might remember the kitsch "Love Is" posters that were all over the London Underground in 2003. One of them tackled this problem and proclaimed that "love is.... letting people off first." 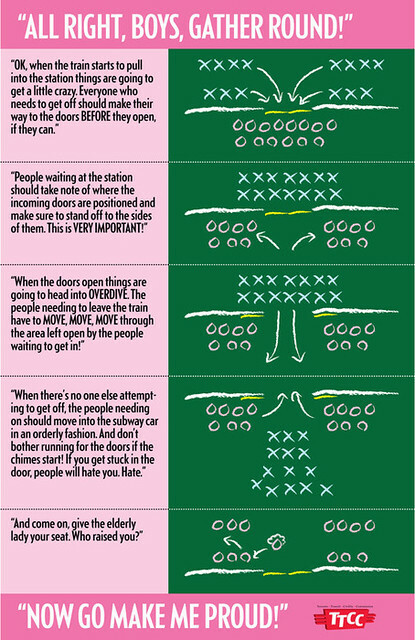 The "Love Is" couple are pictured trying to get off a train while and old lady with bags is trying to barge her way on (Excuse the image size, I can't find a larger version of this). 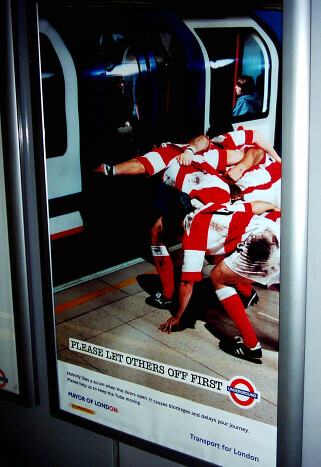 Then in 2004 you'll have seen posters reminding you of the feeling that Tube travel is like a battle. The rugby image works well. The copy's good too "Nobody likes a scrum when the doors open. It causes blockages and delays your journey. Please help us to keep the Tube moving". Moving onto 2008, a different tactic was tried. 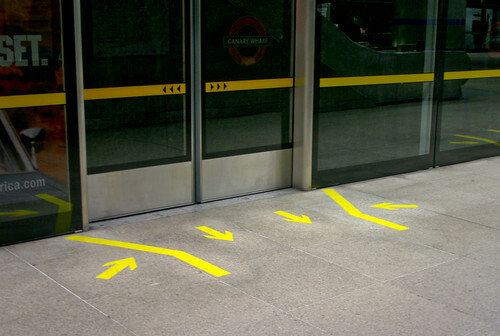 London Underground started to experiment with "directional floor markings". 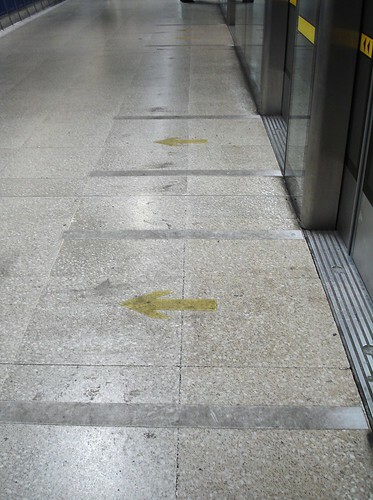 Here's the thought process "Let's put some fluorescent yellow arrows on the platform floor. We won't bother explaining what they mean. People will naturally understand what they mean. We'll trial it for six months and we'll test varieties to see which ones work best." Have you seen these anywhere recently? My guess is very people knew what they meant and it was quietly shelved. 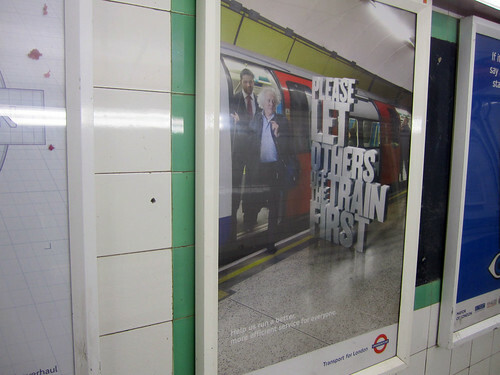 It's not just TfL that have been having problems explaining how to let people off first. Last year Toronto newspaper The National Post tired of the barging behaviour on their subway. They produced a poster which they encouraged people to follow and print. It's deliberately funny, but there's clearly too much detail. It'd never work. Back to London and I'm not sure exactly when it was introduced, but it's post 2004 and TfL seem to think it's done the job up until mid March this year. No bylines or extra copy, no cute cartoons, no photography. It's the clear road sign approach. 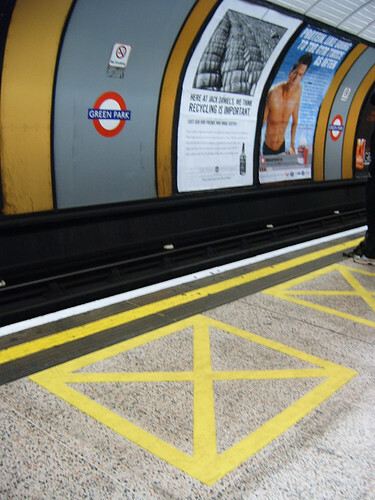 It assumes that people know that the sign means "Give way to oncoming traffic" or in the Tube's case, simply "Give way". Agency: You haven't used photography for a while, how about that? Agency: How about a celebrity? TfL: We haven't got the budget. 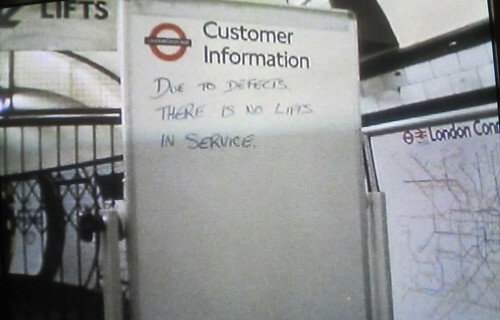 TfL: Too busy with Bikes and the Olympics. Agency: How about someone that looks like Boris? TfL: Possible - but he'd need to be cheap. Agency: What about some irony or a joke? Agency: Oooh! Can we test some cross platform animations or short films? It would be what people saw just as the train pulled into the platform. TfL: No, we have to save those for paying clients or engineering works. Agency: OK what about something with QR codes, so that people can scan them into their smart phones and get taken to an interactive site about how many delays are caused by people blocking doors and stuff. 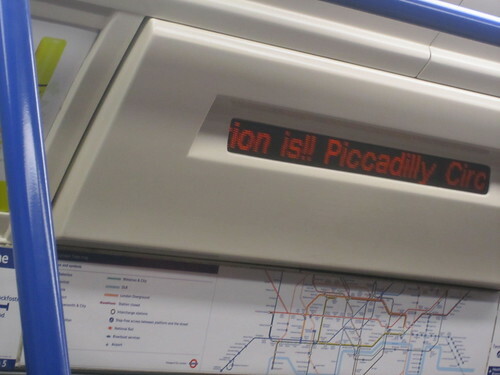 TfL: QR what? Anyway nothing with smart phones, they don't work underground. Agency: OK so we're left with big letters, a Boris lookalike and something that jumps out in your face. Sounds .... er... great. We'll put our best intern with PhotoShop skills onto it. Wonder if it will work?